In a word: Seems pitched at a different demo. Address, hours & details via Isthmus; reviews at EatDrinkMadison.com, Associated Content, Yelp, 77 Square, ; official web site. Brian from EatDrinkMadison.com ate the western crepe with a juice. JM ate the chocolate chip pancakes. Nichole ate the Monte Cristo with a coffee. The bill was $28, or $9.33/person, plus tip - thanks, EatDrinkMadison.com! JM gave Pancake Cafe a B-; Nichole gave Pancake Cafe a C+ (see our grading rubric). Pancake Cafe is a small chain of popular breakfast places a step up from IHOP, along the lines of Original Pancake House. Our dining companion was Brian, the man behind EatDrinkMadison.com, a locally run online entertainment review site, so we had plenty of eating stories to swap over the complimentary coffee during the 25 minute wait for a table, and the additional half hour before our food arrived. To be fair, the place was utterly full - the crowd overwhelmed the smallish parking lot - but the bustle seemed to spill over to the point of frustration for our frazzled server. 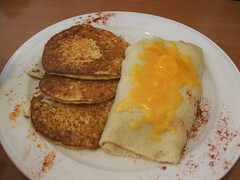 The menu included the usual pancakes, crepes, omelets, and combinations as well as a few sandwiches. Brian opted for a Western crepe with ham and vegetables, liberally dusted with paprika, and accompanied by potato pancakes that were more binding batter than potato. The chocolate chip pancakes were a little dry and there was simply not enough whipped cream. Better to over-serve and scrape than under in this case. 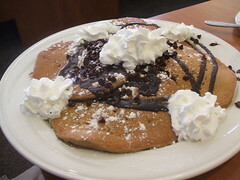 The pancake-iness of the dish was fine, though there was never anything to suggest that this signature item merited a closer look than the chocolate chip pancakes served at other diners in the area. The coffee was touted as "Kona" but no blend was mentioned. 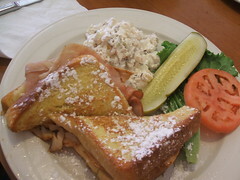 Pancake Cafe's incarnation of the Monte Cristo used French toast around a slice each of American and Swiss cheese, some ham, and thick pieces of white meat turkey. The fowl didn't do the sandwich any favors on the moisture front, though some maple syrup helped. A side of "taffy apple salad" seemed pretty much straight out of Taste of Home magazine. Bottom line, Pancake Cafe is a crowd-pleaser, especially for the older and richer segments of the population, but not much jumps out as fabulous. For those who care to read on, what follows is an early exploration into constructing a grading rubric for the Monte Cristo sandwich. We welcome your feedback before any of this is set in stone. "Authenticity" as it relates to food finds some of its more vocal defenders among sandwich aficionados. Chicago-style hot dogs, cheesesteaks, and Italian beef all come to mind. Nichole's interest in such arguments up until now has been academic - or, more precisely, a matter of interest in the rules themselves and what degree of adherence is demanded for an item to fall under a given classification. With the Monte Cristo she is beginning to take on a yolk (with apologies to Hillel) in a great tradition of sandwich studies. The Monte Cristo Sandwich has creative variations from one restaurant to another. The basic sandwich is made of two slices of white bread with ham, turkey, or chicken, and a slice of cheese. It is then dipped in beaten egg and fried in butter. A classic Monte Cristo sandwich should come with a side of jelly to dip it in. The original grilled cheese sandwich, this consisted of Gruyere cheese and lean ham between two slices of crustless bread, fried in clarified butter. It was originally served in 1910 in a Paris cafe. This sandwich is still a popular snack or casual meal throughout France and Switzerland in most bars and cafes. This definition describes the full immersion version in which the entire assembled sandwich is battered and deep-fried. More common in Milwaukee and Madison is the version where egg-battered French toast is used for bread. Most use Swiss instead of Gruyere. There are other variations; some are open-faced. Some are obviously art projects. So what makes a perfect Monte Cristo, Milwaukee-style, for want of a better term? Bread: The French toast can be made from Texas toast or bread of standard thickness, but it should be moist inside and slightly crispy outside. The egg should impart flavor and heft but not overwhelm. Meat: The ham and turkey should be thin-sliced, deli-style, and preferably lightly grilled but definitely warm. Cheese: Swiss is the only option, and just enough to taste and bind the meats together. Construction/presentation: The flavors should be balanced, but at all costs, the Monte Cristo must not be so tall you can't get your mouth around it. Cutlery should not be necessary, though its use is the prerogative of the eater. Maple syrup should be provided. (Jam is already on the table at any venue worth its salt.) Finally, no kind of grilled cheese sandwich should ever be presented upended unless the chef properly anticipates and counteracts the very real and tragic possibility of all the cheese pooling onto one side of each piece. So, dear reader, help us define the perfect Midwestern Monte Cristo. And let us know where you think the best one in Madison can be found. The gold standard in Monte Cristo sandwiches has been, since I first tried one as a kid, the famouse Monte Cristo at the Blue Bayou in Disneyland. The sandwich is made with swiss, smoked ham and turkey, quartered, dipped in a light egg batter, and deep fried. IIRC, it was served with a sprinkle of powdered sugar and a jelly dipping sauce on the side (which internet research tells me was red currant jelly). I do not accept a sandwich made with French toast as anything like a Monte Cristo. It wasn't until I left home that I was introduced to "salads" made with cool whip and/or marshmallows. My parents tried to shelter me from scary things like that. I think every Taste of Home recipe has either cool whip, marshmallows or a can of cream of something soup in it. My favorite ToH recipe is for lemon pound cake, found in the "men in the kitchen" section of an issue from the mid-90s, I believe. I was disappointed that it relied pretty heavily on lemon extract, as opposed to actual lemons, but darn if it isn't moist and tasty. And while I love a good Monte Cristo, I haven't found one in Madison. Granted, I haven't looked very hard, but there has to be one out there somewhere. That said, I've been to Pancake Cafe once and was thoroughly unimpressed. I had the spinach crepe, and the crepe batter they use is much better suited to a sweet filling. It threw the whole dish off. Also, the "aged cheddar cheese sauce" mentioned in the menu description tasted more like Campbell's cheddar cheese soup. You also mention the wait possibly being tied to how crowded it was. The day we went, there were maybe two or three other tables, and while we were seated right away, it was still about a 15-minute wait before our order was taken and an additional 30-minute wait for the food. Average to sub average. Bacon and Eggs = OK. Pancakes = edible. That's about it. Yeah, I kinda want the next review to come soon so I don't have to look at that sad Monte Cristo plate anymore. But I'm not to optimistic about the next place on the List, either. While I can't vouch for its authenticity, Claddagh at Greenway Station offers a Monte Cristo sandwich that I've always liked. The menu, as I recall, says it's an "Irish" version, but since it was the first Monte Cristo I ever had, I don't remember what the difference is. It didn't come with maple syrup, but they did give you jam. That's the only one in Madison that I've found. My wife and I ate here last week. I had the huevos rancheros and they were fantastic. My wife tried the eggs benedict, which were also delicious. I was less than impressed with the Kona coffee. Not much taste and very weak. My father-in-law tried the German pancake, which is massive. All in all, a very delicious meal. There used to be one out in Middleton that was night-and-day compared to the one in Fitchburg. Fantastic service and fantastic food. We went there by accident while looking for Original Pancake House. When we did finally go to Original Pancake House it was a disappointment compared to that Pancake Cafe location. It's too bad the location in Fitchburg is so disappointing. I agree with Diana that the Monte Cristo was great at Claddagh. I'm using mom's groupon this Friday for the Fish Fry. I hope it's better than their breakfast, but I'm definitely not optimistic.